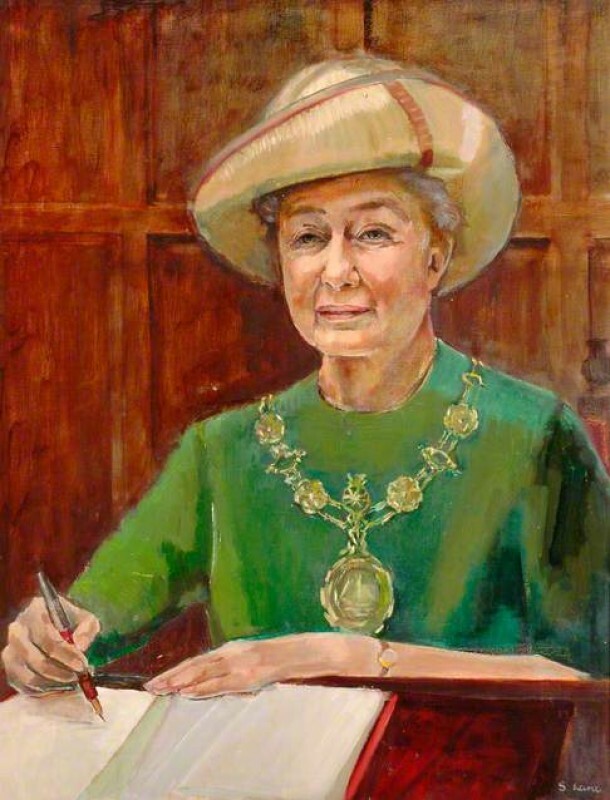 Scarborough Collections wanted to know more about the subject of their painting, 'Portrait of a Mayoress' by Stella Lane. It was clear that the portrait was set in Scarborough Council Chamber, with the panelled walls forming the background, whilst the Mayor signs off a set of minutes. The regalia in the painting supported the assumption was that the subject was an elected mayor, rather than a mayor’s wife. Osmund Bullock got in touch with Scarborough Town Hall who checked the past Mayors board: the only female Mayor in the right timeframe was Ida Cartwright Clarke (1972–1973). Scarborough's Civic Officer Irene Webster also got back in touch, to explain the sitter is likely to Ida Cartwright Slarke (not Clarke): born in 1897 in Sutton Coldfield, the eldest daughter of a carpenter, Slarke was a teacher. She died at Scarborough in November 1990. Interestingly, Irene Webster emphasised ‘Mayoress’ specifically means a Mayor's wife. She, like her male counterpart, is always called ‘The Mayor’. After more discussion, the artist’s great niece got in touch. The painter was a Stella Langrick: a self-taught artist who was born in Camberwell, London but lived in Scarborough. She also painted a portrait for the playwright Tom Stoppard, but usually painted still life. She used Lane as a pseudonym for her painting. The artwork now has a named sitter (Ida Cartwright Slarke, 1897–1990, Mayor of Scarborough, 1972–1973), an estimated execution date of c.1972, and more information is known about the artist, Stella Lane/Stella Marie C. Langrick, née Boon (1915–2002). Who is the 'Mayoress' depicted in this portrait? Can she be identified?